Today I was spending a short afternoon rest at the Tanjung Batu shoreline. 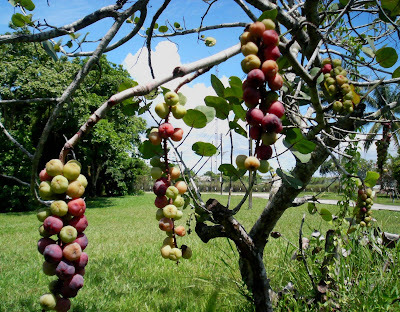 Much to my delight I noticed this Sea Grape tree ( Coccoloba uvifera) fruiting and on some branches the fruits were ripe in purple colours. 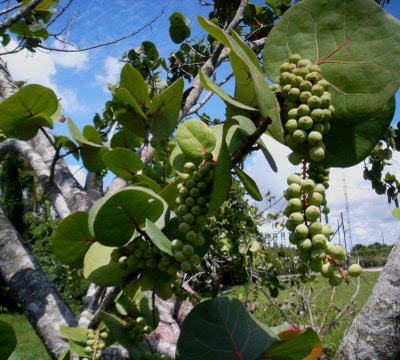 Sea Grapes are a tropical tree that does well along coasts, well drained soil and in full sun. Note the almost circular shape of the leaves ( about 20 - 30 cm long. The ripe fruits are edible. I have tried to propagate them previously by seeds and I found that the germination rate was about 70 %. Presently I do have a healthy specimen grown at my eco-farm. Saree Point provides you latest and high resolution photos of saree or sari. The blog has daily updates of photos. You can find here saree images of Bollywood, South Indian actress, Saree Model and also different types of sarees. You can find all at once place, called saree point.